This morning, ABC's "Good Morning America" aired a 7:15 a.m. segment on the controversy about the proposed HPV vaccine mandates, on which I appeared to state "I think parents are wondering why every time industry produces a vaccine it is automatically added to the mandatory list for school entry." Tonight from 9 to 11 p.m. EST the network will broadcast a special two-hour show featuring libertarian John Stossel and his view of how people perceive risks and whether the actions they take to minimize their perceived risks can have unintended consequences. I was interviewed for this show and, today, was informed by A-CHAMP in their Action Alert that the show is entitled "Scared Stiff: Worried in America" and that promotional copy for the show states "Stossel looks at the debate and concludes that activists and lawyers may be killing people by frightening the public about vaccines." In its Action Alert, A-CHAMP said that parents had already contacted ABC to register disapproval of "one-sided and inflammatory programming and promotion." I hope that the segment of this show about vaccine safety concerns of the public is not as one-sided and inflammatory as the promotional rhetoric suggests. If it is, then most likely the goal of the show was to shut down the vaccine safety and informed consent debate that has been taking place in the living rooms of families across America for the past two decades and has begun to be addressed in the public arena during the past two months. 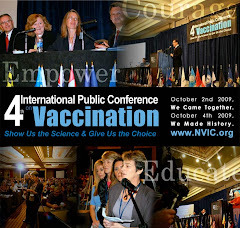 There is nothing that anyone can say or do on television or radio or in the pages of medical journals or newspapers which will erase the experience of hundreds of thousands of parents in America, who have witnessed their once healthy children regress physically, mentally and emotionally after receiving one or more government mandated vaccines. The truth about vaccine risks and the perception of those risks belongs to those who take the risk and are left to deal with the consequences: mothers and fathers in America and around the world. Children who are injured or die from vaccination are equally as important as children who are injured or die from infectious diseases. The hallmark of a humane society is to care about all human life and not consider some expendable in service to the rest. 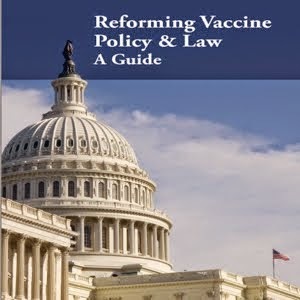 The National Vaccine Information Center is proud to stand for the right of citizens to have access to all information about the risks and complications of diseases and the risks and complications of vaccines and the right to make an informed, voluntary decision about which risk to take. Thank you for representing the parents and citizens of America who deserve to have a better system for monitoring and improving the safety of vaccines and compensating those who are injured and pay the ultimate price on behalf of the public's health. As a journalist, Mr. Stossel behaved in an extraordinarily unprofessional manner and he insulted our intelligence. I'm not scared of vaccines. I'm scared of the people who have radical and intolerant views about vaccines (usually those with hard-core pro-vaccine ideologies) and who are consumed with trying to make everyone else do what they think is right. The issue of vaccines, child health and the prevention of vaccine-induced injury and death needs be the focus of serious and sincere discussions among consumers, clinicians, manufacturers and government regulators. Currently, the system is broken and as the 200,000 plus reports filed with the Vaccine Adverse Events Reporting System and the over 1 billion paid out through the Vaccine Injury Compensation Program payments show, vaccines are far from harmless. Until the system is greatly improved, parents need to educate themselves, make the best decisions possible and then brace themselves for some serious negaive fallout should they decided to make a choice that is unpopular with those who believe parents should just do as they are told. Thank you for the massive amount of work you have done with the media over the past 10 days. It is an impressive accomplishment on behalf of all of us trying to raise our children in a world obcessed with consuming increasingly toxic pharmaceutical products. You are, indeed, a national treasure. When history is written on the issue of vaccines and human rights - you will assume a rightful place as a champion of parents and children victimized by a system that would rather hide the evidence of it's failures than honor those who lost our careers, health, marriages, families and children to the ravages of vaccine-induced damage and for the good of others. Whatever it is that you enjoy - maybe a glass of scotch and a cigar - you deserve to celebrate a job well done! I just realized that Vaccine Awakening blog needs to be listed in my high priority links. This fight goes beyond personal health issues. You are fighting for the health of our national psyche. I'm going to monitor your site daily. My own children are now 18 and 20. I fought all their lives to keep them vaccine free. Wish I had had your blog as a resource. Mothering Magazine does a pretty good job too.